Though H.265 whose full name is High Efficiency Video Coding (HEVC) has been introduced to the public in early 2013 as the successor of H.264 (AVC), it hasn't dominated the market yet. H.264 is still a mainstream video compression format which is widely accepted and used in Blu-ray discs, internet sources like videos in YouTube and iTunes Store, web software, and also HDTV broadcasts over terrestrial, cable and satellite. However, the hot discussion about H.265 and H.264 never stops. In this post I will focus on three aspects to give you a clear clue about H.265 and H.264. What is H.264 (MPEG-4 AVC)? H.264 is an industry standard for video compression, the process of converting digital video into a format that takes up less capacity when it is stored or transmitted. It was first introduced by a group of JVT (Joint Video Team) experts in May, 2003. H.264 is used today to put large amounts of video into any setting with limited bandwidth. Websites such as YouTube, DailyMotion, Hulu and Netflix all have capitalized on the H.264 codec's ability to squeeze a large amount of video into a small space. European HDTV is broadcast using H.264, along with Blu-ray DVDs. Since 2003, when people say "MPEG 4 Part 10", "AVC", "H.264", they are taking about the same thing. However, please note that H.264 and X264 are not the same thing. H.264 is the codec while X264 is the encoder. Namely, MPEG-4 Part 10, aka H.264/AVC, is a standard. x264 is an encoder that implements that standard. That is, x264 is a program that outputs H.264 files. High Efficiency Video Coding (HEVC), also known as H.265, is a new video compression standard after H.264. Like H.264, it is jointly developed by the ISO/IEC Moving Picture Experts Group and ITU-T Video Coding Experts Group (VCEG). H.265 was developed with the goal of providing twice the compression efficiency of the previous standard, H.264 / AVC. H.265 can almost support 8K UHD (8192x4320), which laid a solid foundation for the coming 4K Time. Currently, you can play HEVC videos on some media player such as Roku 4, Amazon Fire TV (2015) and Xbox One. Compared with H. 264, the greatest strength of H. 265 is that it has a higher compression ratio, which means that H.265 can provide you with higher quality while smaller size videos than that H.264. For example, a 137 MB video will be reduced to 37.7 under H.264 while shrink to 17.7 codec by H.265. Some of the key differences between H.265 (HEVC) and H.264 (MPEG 4 AVC) are listed below. 4. High definition videos like 1080p, 4K, 8K resolution videos. Computationally expensive (~ 300 % +) due to larger prediction units and expensive Motion Estimation (Intra prediction with more nodes, asymmetric partitions in Inter Prediction). Obviously, H.265 is the codec of the future. So, do you want to convert videos to H.265? In this way, you can reduce the size of your HD videos without quality loss. Video Converter Ultimate is integrated of HEVC/H.265 encoding and decoding. With this software, you can convert videos to HEVC/H.265 480p, 720p, 1080p and 4K UHD 4320p. Not only can it encode videos to H.265, but also decode H.265 to common videos files. Download the program on your computer and follow the steps below to start conversion. It enables you to convert any videos you want.Let's have a try! Step 1. Click "Add Files" to import target file to the program. Step 2. Go to "Output Format" > "Format" > "Video" and choose "HEVC Video" as your output profile. Step 3. Specify output folder to save H.265 video file. Step 4. 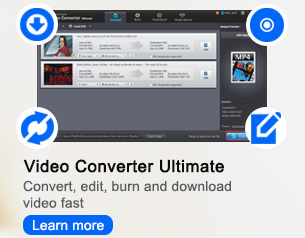 Press on "Convert" button to start convert video to HEVC. According to the comparison between H.264 and H.265, the advantages of H.265 is obvious. With Video Converter Ultimate, you can convert video to H.265 with higher quality but smaller size than eve before. On the contrary, if you got some H.265 videos but don’t have any device to play them, you can convert them to common videos. Just have a try. MP4 vs. WMV: What are the Differences?